The Selling Season | Camps | Kids VT - small people, big ideas! The cookie aisle at the grocery store offers dozens of choices, but Tagalongs, Thin Mints and Samoas aren't among them. Those sweet treats can only be purchased from Girl Scouts, and only during the first few months of the year. If you're excited to get your hands on boxes of Do-si-dos and Trefoils, troops of girls in kindergarten through 12th grade are just as excited to sell them to you. 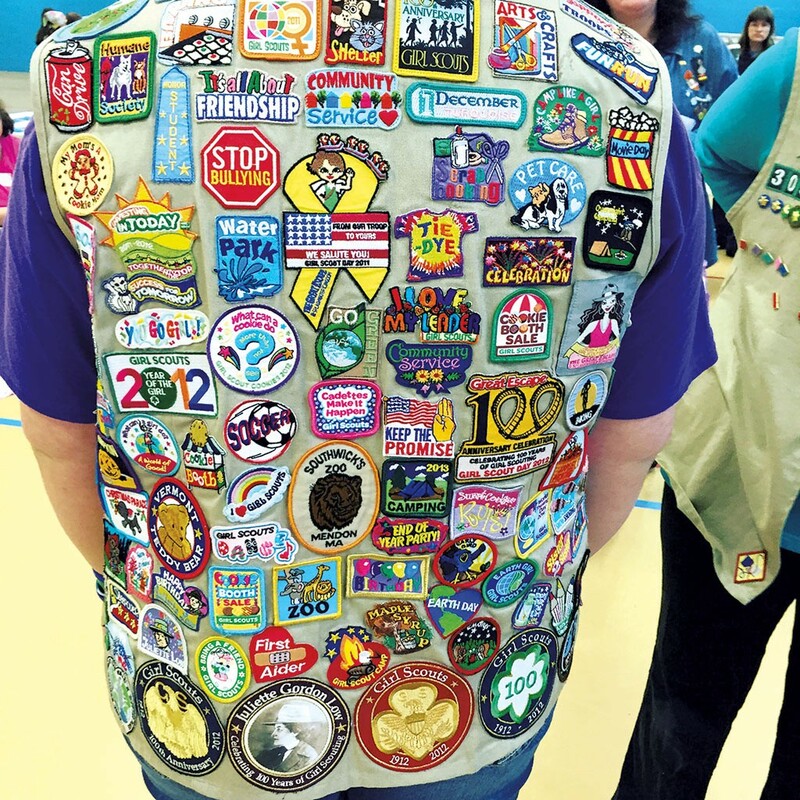 On a rainy Sunday afternoon in January, hundreds of Girl Scouts in patch-adorned vests and sashes scuttled around the gym in Burlington's Robert Miller Community and Recreation Center. They made name tags and chatted while waiting for the main event to begin: the Cookie Rally. "Good afternoon, Girl Scouts!" boomed Tricia Mellor on the mic. The chief executive officer of the Girl Scouts of the Green and White Mountains, herself a lifelong scout, rallied the troops. "Why are we here today?" "Cookies!" replied 300 girls in unison. Mellor — sporting a ponytail, jeans and a bright-pink T-shirt with "I ♥ Cookies" on the back — launched into a cookie dance. She shuffled back and forth, clapped, kicked, and waved a bandana over her head to a twangy tune called "Cookie Time." The younger girls in the crowd followed along, while some older girls hung back, giggling self-consciously. 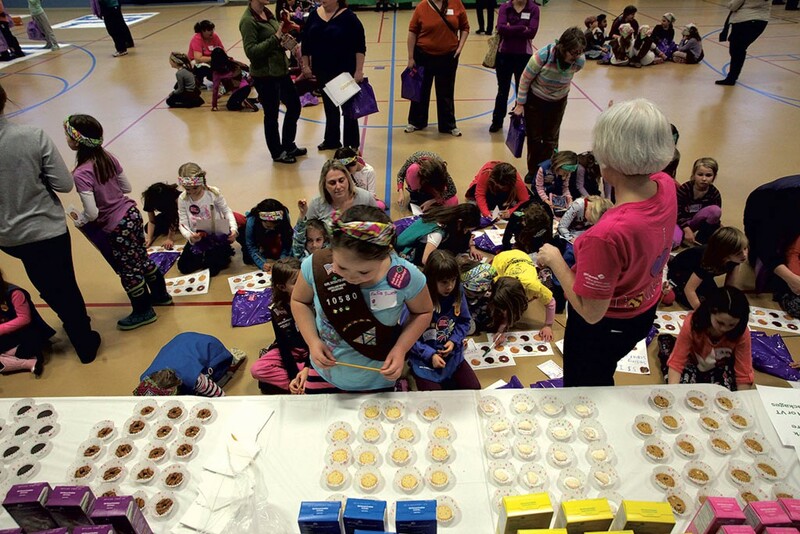 The rally was one of five similar events in Vermont and New Hampshire organized by the GSGWM, designed to kick off cookie season for the nearly 8,000 Girl Scouts in those two states. At the Burlington rally, the girls circulated through different stations where they answered trivia questions, perused a merchandise table and sampled cookies. Many people are familiar with the treats that Girl Scouts peddle — in their neighborhoods, at their parents' workplaces, even at grocery stores — in a rush to sell enough to meet their personal goals. In Vermont and New Hampshire last year, scouts sold an average of 169 boxes each, totaling 1.2 million boxes. Nationwide, scouts sold 194 million boxes, bringing in some $776 million. 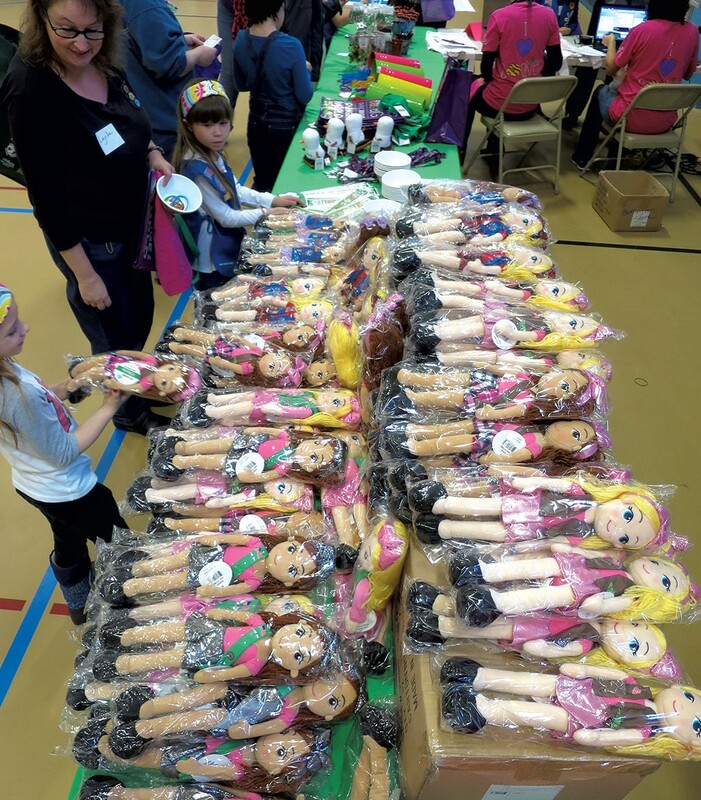 Of those proceeds, 49 percent goes back to Girl Scouts' regional council — in Vermont, the GSGWM — for programming, property maintenance, training and financial aid. What cut goes to the individual troops? For every $4 box, 55 to 65 cents, which can be used for activities or service projects. One year, a Bristol troop used some of their proceeds to buy a feed-store gift card for a local boy starting an egg business after his family lost its barn in a fire, explained troop leader Carolyn Knight. The girls also win prizes based on the number of boxes they sell. Winooski 9-year-old Isabella Erwin, whose mom, Jen, coleads her troop, is hoping to sell 1,000 boxes this year to earn a pair of custom-designed Converse, her favorite brand of shoes. Jen says her daughter "has loyal customers in the neighborhood saying, 'Make sure you come see me during cookie time.'" If scouts sell at least 100 boxes, they earn "cookie dough," currency they can use toward Girl Scout swag, international travel programs and summer-camp tuition. 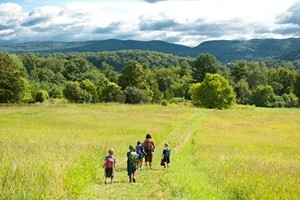 In Vermont, the GSGWM runs two camps that are open to Girl Scouts and non-scouts alike: Camp Farnsworth, a day and overnight camp on a 200-acre facility in Thetford with a lake, woodsy trails and a horseback-riding facility; and Camp Twin Hills in Richmond, which is more rustic, with lean-tos and picnic tables, and is mainly a day camp but offers campers the opportunity to sleep there one night. Winooski 9-year-old Gabriella Lothrop-Penn has fond memories of her overnight at Twin Hills last year, where she had a dance party in the camp's pavilion and played nighttime flashlight tag. For the past two summers she's paid the $199 camp tuition using cookie dough, supplemented by a $49 scholarship. This year, she hopes to sell 650 boxes so she can attend Girl Scout horseback-riding camp in New Hampshire. Amy Lothrop, Gabriella's mom and coleader of the Winooski troop, says getting out into nature is particularly meaningful for her group of "city girls." This year, her 17 troop members, from kindergarten to seventh grade, will use cookie money to pay for a camping trip, community service projects and badges, which they earn for completing specific activities. 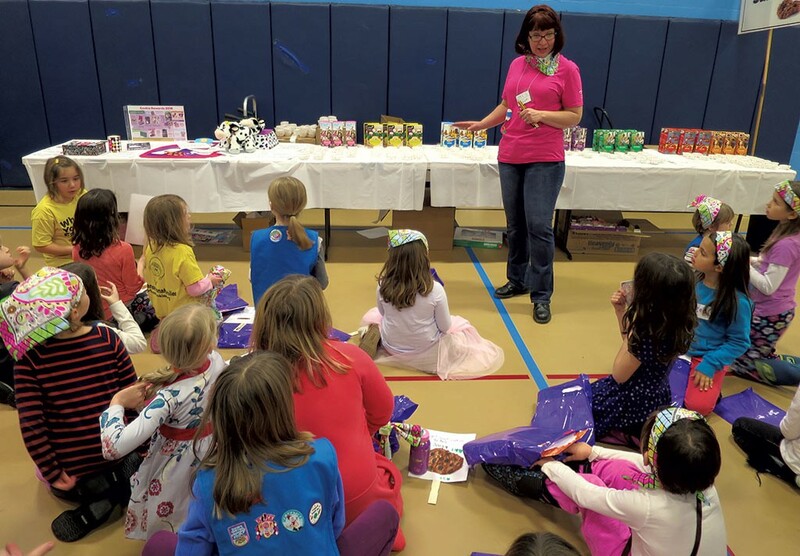 GSGWM CEO Mellor says that selling cookies also helps girls learn financial literacy, leadership and interpersonal skills, and how to set goals. Sixteen-year-old Gabrielle Fenton of Milton can speak to that. The Girl Scout ambassador — the title given to scouts in their junior or senior year of high school — says the experience of asking random people if they want to buy cookies has helped her socially. "I was really shy, and it helped me break out of my shell," she says. Fenton started as a Girl Scout Daisy in kindergarten and has been selling cookies since first grade. This year she hopes to sell 501 boxes — one more than she sold last year. Selling cookies also helps scouts learn to deal with rejection, says Mellor. One mother, Mellor recalled, said her daughter's experience of having her first potential customer turn her down turned out to be a positive one. "It's OK to have someone say no to you," Mellor said, "because that's what it's going to be like in the real world." But, especially for the youngest scouts, selling cookies is really about having fun, Mellor says. As the Burlington rally wrapped up, the group reconvened to give the cookie dance one last whirl. Then the girls put on their coats and emerged from the community center, energized despite the cloudy, wet afternoon. There was no time to lose: Cookie season was officially under way. "Welcome to Lily's Cookie World," reads a banner on 8-year-old Lily Williams' personalized Girl Scout-cookie website. Her "Cookie Story" explains that proceeds will help her troop pay for field trips and snacks. A bar graph shows how much progress she's made toward her goal 275-box goal. The Shelburne third grader even has a video where she describes the different cookie varieties. "If you would like to order cookies, click on the link below," she says sweetly. Last year marked a new chapter in Girl Scout cookies — online sales. The digital cookie platform allows girls to create a personalized webpage to supplement door-to-door sales. About 1.3 percent of total cookie sales in 2015 were online purchases. In Vermont and New Hampshire, less than 1 percent of sales were digital. This year, thanks to a $3 million investment from Visa and Dell, the Girl Scouts of the USA were able to make major digital advancements: an upgraded version of their online platform that includes games, quizzes and tools to help girls set cookie-selling goals; a new mobile app to facilitate face-to-face cookie orders; and a donation of tablet computers to help underprivileged scouts take part in the Digital Cookie 2.0 program. Locally, Dell gave the Girl Scouts of the Green and White Mountains a $20,250 grant and donated 150 tablets over a three-year-period. The efforts are aimed at engaging underserved girls in the Digital Cookie program and at teaching them financial, digital literacy, business and time-management skills. At the Burlington Cookie Rally in January, girls got a chance to use some of those tablets and learn more about Digital Cookie 2.0. 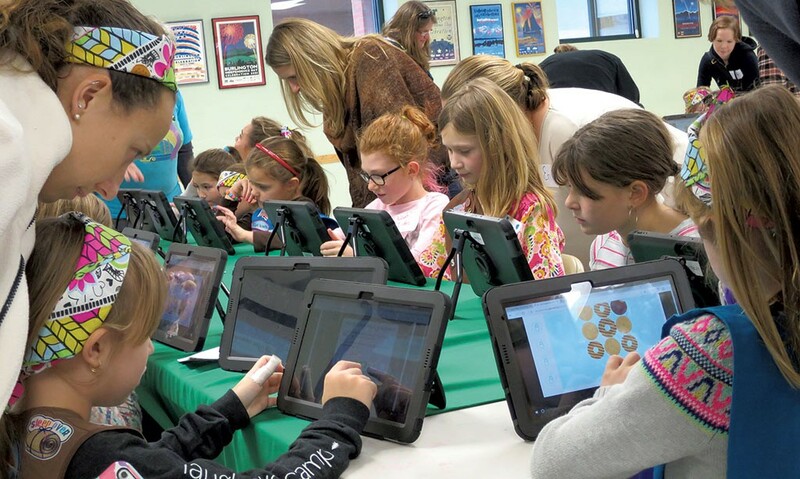 In a large room off of the gym, which a Girl Scouts staffer introduced as the "Dell Digital Cookie Lab," several dozen tablets were divided among four tables. The girls watched a brief video on internet safety before checking out the new cookie-selling page. Third grader Teryn Hytten of Shelburne spent a couple minutes playing a game called Cookie Crave, dragging and dropping different varieties of cookies into lines for points. She said she might create a personalized cookie-selling page this year. "I like it. I think if I explored it more, I'd set it up," she said. "It seems really fun." Selling cookies online isn't going to replace the old-fashioned method, says Mellor. Lily created her website as a way for faraway family and friends to order from her. The site was easy to set up, she says, and she enjoyed personalizing her page. She says she'd only change one thing: the high shipping cost, which starts at $9.95 for the minimum 4-box online order. Her dad, Stan, shared Lily's webpage in a Facebook message. "A new age is upon us," he wrote, "ordering Girl Scout cookies online!"